In Chapter 1 we saw that it is often handy to have artificial gravity in the otherwise microgravity conditions in orbit (see the section Satellite Experiments). It makes life for astronauts much easier and healthier. We have also seen that to prevent motion sickness, two rotations per minute are about the maximum allowable. That means that the simulation of Earth gravity (1 gravity, or 1g) requires a rotational radius of 220 meters (720 feet), and the lower Mars gravity of 0.38g requires a radius of 90 meters (300 feet). The creation of artificial gravity using two tethered spacecraft was the first ever tether experiment performed in space, on Gemini 11 (see Chapter 4). The gravity level reached during that mission was very low, but it proved that the concept works. An artificial gravity spacecraft could consist of two modules and a tether deployment system that are launched together. When the modules undock and move away from each other, they would unreel a long tether. The amount of rocket thrust and thrust duration needed to spin up the assembly is smallest when the radius is at its maximum. However, it will probably prove best to first deploy a limited length of tether and then initiate some rotation, to provide a steady pulling force to deploy the rest of the cable. That would prevent the bouncing effects and tether loops experienced by Gemini 11. A rotating tether system to generate artificial gravity is an important part of the famous Mars Direct concept first published by David Baker, Owen Gwynn, and Robert Zubrin in 1990, and subsequently in Zubrin's popular book, The Case for Mars. It describes how a crewed, relatively low-cost mission to Mars could be based on known technology and much already-existing equipment. The Mars Direct designers propose that on the way to Mars, the manned spacecraft is kept connected to its launcher's upper stage by a 1.5-km-long (0.9-mile-long) tether. A once-per-minute rotation of the assembly around the common center of mass (which lies closer to the crewed module because it has a higher mass than the upper stage) would let the astronauts experience the same level of gravity as on the Martian surface. This is expected to prevent many of the physiological problems that are typical for long duration flights in microgravity. It would ensure that the crew would be able to work effectively right after landing, being already used to Martian gravity conditions. Otherwise, spending the whole half-year flight to the red planet in microgravity, the astronauts might not even be able to walk; even astronauts flying half-year space missions onboard the ISS usually need to be supported after landing back on Earth. Near Mars the upper stage and tether would be discarded, leaving the crewed spacecraft free to maneuver and land unhindered. A similar low-mass artificial gravity system was already proposed as part of a Mars expedition concept that TRW studied for NASA in 1963. Their design used a 152-meter-long (500-foot-long) tether and a rotation rate of two rounds per minute to generate Marslike gravity conditions inside the piloted spacecraft. The Dutch company Delta-Utec, of the YES and YES-2 tether satellites, has proposed a much more ambitious system named Mars-g. This involves what is basically a small space station consisting of a crewed ''hab,'' a tether system, and a passive module acting as a countermass. Astronauts would dock their Soyuz spacecraft to the hab, then disconnect the countermass module, unreel the tether, and initiate a rotation using a rocket motor on the hab module. Navigation sensors will need to be able to cope with the rotation, but that is in principle not a problem as many existing satellites and interplanetary probes (so-called spin stabilized spacecraft) constantly rotate as well. Antennas and solar arrays that need to be pointed at fixed locations can be put on mechanisms that rotate against the movement of the habitat— what are called de-spun platforms. 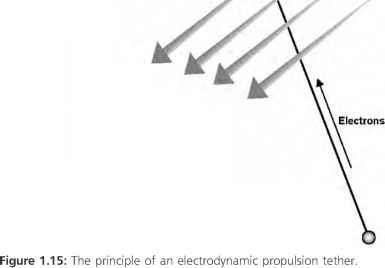 Maneuvers using rocket thrusters can also be performed while the assembly is rotating, as long as the thrust is low enough that the centripetal force can keep the tether taut. Series of short bursts ofrocket thrust at the right moment during each rotation can result in the same change in velocity and direction as a single long thruster burn. The level of gravity could be controlled simply by varying the rotational radius, without the need for rocket propulsion. Just like when a spinning ice skater draws in her arms, so will the assembly start to rotate faster when the tether is reeled in. Conversely, when the tether is further deployed the rate of rotation will diminish (this is called the principle of angular momentum conservation, which states that for a simple rotating system of two masses connected by a tether, the rate of rotation multiplied by the radius squared remains constant; Fig. 5.3). Figure 5.3: Gravity levels can be changed by varying the length of the tether only, according to the principle of angular momentum conservation. always providing the possibility to stop a mission and a return to Earth at any moment (something not possible during an actual mission to Mars). Walking inside the living module of a rotating assembly, going around two times per minute and creating a 1g environment, would be just like on Earth. However, running would result in some peculiar, very un-Earthlike phenomena. A sprint in the same direction as the module is moving effectively increases the runner's rotational velocity, resulting in a higher level of artificial gravity. Thus, the faster one runs, the heavier one feels. A sprint against the direction of the rotation has the opposite effect: it decreases the runner's rotation speed and thus the gravity level the runner experiences. In that direction, running will enable the runner to lose weight fast, but only as long as he or she keeps moving. Inside a rotating module with Earth-like gravity, one could feel about 20 percent heavier or lighter by running, depending on the direction in which one moves. Using a motorbike to get to 160 km/h (100 miles per hour), one could go fast enough to fully compensate the station's rotation, effectively not rotating at all and thus become weightless—except that speeding on a motorbike would not be feasible inside what is probably a quite small living module. However, rotation is not really necessary to achieve a low level of gravity inside a spacecraft. 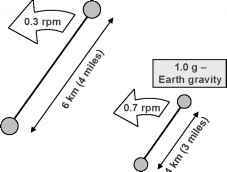 We have already seen that two satellites connected by a tether and orbiting a planet will automatically assume a vertical position due to the gravity-gradient stabilization principle. The upper satellite is effectively orbiting too fast and tries to pull away, while simultaneously the lower spacecraft tries to fall down. If an astronaut were to inhabit the top spacecraft (module) in such a gravity-gradient stabilized system, he would also fly around Earth too fast and therefore be flung against the ceiling (which he could regard as being the floor of his accommodation). This would thus enable him to stand up as if there were gravity, but upside down with respect to Earth's surface. At the same time, his colleague in the lower spacecraft would effectively be pulled back to Earth and therefore be able to stand on his module's floor, upright with respect to Earth. In effect, inside each habitation module there exists an imbalance between the centrifugal force caused by the system's rotation around Earth and Earth's gravitational force, causing a net force that the astronauts perceive as gravity. 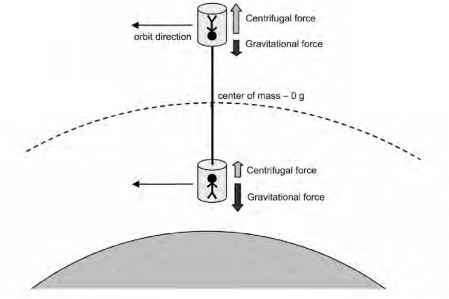 The centrifugal and the gravitational force are exactly equal but opposite at the system's center of mass, where the resulting gravity level is thus zero (Fig. 5.4). Figure 5.4: Astronauts living in a gravity-gradient stabilized space station would experience a low level of gravity inside each habitation module. make life in space a bit easier. Drinks could be poured into glasses, tools would gently fall down instead of floating away to unreachable places, and astronauts could enjoy a real shower. There is also a good chance that the many physical and psychological problems connected to life in microgravity would be considerably alleviated. Moreover, with such a station it would be possible to do experiments in gravity levels ranging from 0g (in the system's center of mass, exactly between the two modules) to 0.01g (inside each module). A small elevator cabin riding the tether between the two modules would make it possible to precisely choose the required gravity level in this range.